This page provides resources for outreach events related to gravitational waves, LIGO, black holes, relativity, etc. This collects only those resources that I personally like and have used at NEAF and other outreach events. Pictures from NEAF 2015 and MSU news item. More pictures showing the entire NEAF 2015 event, and also this Sky & Telescope article about NEAF (you can see our booth in the lower left). Youtube clip of NEAF with some shots of our booth and space-time spandex demo. LIGO: A Passion for Understanding [space.com site], [Kai Staats' site], [youtube]. LIGO: Generations [space.com site] [Kai Staats' site], [youtube]. Gravity: Making Waves, short science bulletin by the American Museum of Natural History [AMNH site], [youtube]. Can also find a downloadable version in hi-res here. This is a good length and appropriate level for an expo booth. LIGO 7min documentary video [youtube]. Seems to be a clip from Einstein's Messengers. Good, but low resolution. LSC stickers(link to EPO wiki with other print resources; password protected) + Einstein@Home postcards. GW APS poster. I print this out on standard letter paper and use as a handout. This provides a nice concise summary of GWs and LIGO. LIGO Maze (medium and difficult levels printed out on front/back of page. The "easy" version of the maze seems a little too easy.) I like the mazes better than the other "for kids" resources like crossword puzzles as it seems more accessible to a wider audience. LIGO Science Summaries. In particular, those related to the first detection. For give aways/prizes there are items on the LSC CafePress site. I recommend the LIGO magnets or the LIGO Mugs. See also t-shirts related to the first detection. It would be good to find a cheap manufacturer of LIGO-branded pens, keychains, laser pointers, etc---which could be given out in large numbers. CafePress items are rather expensive. Trailer for LIGO: A Passion for Understanding [2min, vimeo, youtube]. The trailer is really good; has great music and images, and is short. Good for a display. APS TV clip on LIGO [~6min]. Very good short video, but now out of date. Could be dropped from list. Highly precessing binary BH(SXS), or this other spinning, precessing binary BH merger, or this updated 6 to 1 mass ratio merger (without spin vectors but showing horizon merger nicely). See the SXS youtube channel for many other nice animations. EMRI animations by Steve Drasco. Especially good for displays are: this one, this one, and this one. Animations from Ajith's group at ICTS based on PN dynamics. Each is ~30sec long; the two non-spin simulations and the spinning-precessing one show a good range of characteristics. Gravity: Making Waves, short science bulletin by the American Museum of Natural History [AMNH site], [youtube]. [~7.5min] Can also find a downloadable version in hi-res here. This is a good length and appropriate level for an expo booth. Trailer for LIGO: Generations [2min, vimeo, space.com]. More people focused, the I prefer the Passion trailer. To save youtube videos to your computer follow the instructions here. Small interferometer demo: see the Thorlabs website for some of their interferometer kits. We have a 50+ year-old-version of something like this overpriced PASCO unit. Euler's disk. A neat demo who's sound imitates the "chirp" of an inspiraling binary. See the company website and this video. Could combine this with Audacity audio software to make a live plot of a chirp sound. Games from LaserLabs work really nicely on an iPad. These include "Pocket Black Hole" (simulates gravitational lensing of the phone/tablet camera image) and "Stretch & Squash" (simulates stretching and squeezing of a gravitational wave on camera or stock images). You can find Windows or MacOC versions of these and other games at this link. BH Slingshot. Java. I was not able to get this to work. Sounds of Spacetime. My totally awesome site. Explore the "sonification" of gravitational-wave signals. Learn how different input physics affects the signal and corresponding sound. Requires manual interaction (i.e. no videos or automatic displays), but works very nicely on all browsers, including mobile devices. Scott Hughes' EMRI sounds are pretty good too. Here is a link to a zip file containing the best of the above resources (updated May 2016). It includes documents, movies, video games, merger animations, and powerpoints. Download this to a USB, copy the folders to a few computers and you'll have a plenty of material to show on several monitors/laptops at your next event: [EPO-files.zip, 867MB]. Thorne's review article "Probing Black Holes and Relativistic Stars with Gravitational Waves" from 1997. See also his classic article in Hawking and Israel's 300 Years of Gravitation. 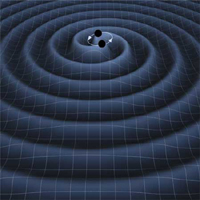 A recent article by K. Riles: Gravitational-waves: sources, detectors, searches. Gravitational Waves from Merging Compact Binaries, an excellent review by Scott Hughes. Listening to the universe with gravitational-wave astronomy, another review by Hughes. New physics and astronomy with the new gravitational-wave observatories, a good but slightly older review by Hughes, Marka, Bender, and Hogan. Review article in Reports on Progress in Physics by the LSC. "Gravitational wave astronomy", review article by Gonzalez, Vicere, and Wen. Brief overview of Advanced LIGO by Greg Harry. Gravitational Wave Astronomy by Camp & Cornish. Gravitational waves on the back of an envelope, by Schutz. A nice intro to GWs at a level that does not require GR. An excellent article by Saulson whose title proposes the question "If light waves are stretched by gravitational waves, how can we use light as a ruler to detect gravitational waves?" Three more nice articles by Saulson: Interferometric gravitational wave detection: accomplishing the impossible, Physics of Gravitational Wave Detection: Resonant and Interferometric Detectors (short version) (long version). LIGO Academic Affairs Council (LAAC). Has good resources for students, especially the Educational Resources page. LSC Publications and Presentations (P&P) Committee. This material is based upon work supported by the National Science Foundation under Grant Number PHY-1308527. Any opinions, findings, and conclusions or recommendations expressed in this material are those of the author(s) and do not necessarily reflect the views of the National Science Foundation.